Working in partnership with Nottingham City Council, Scania, Alexander Dennis and Roadgas, with part funding from OLEV (Office of Low Emission vehicles), Nottingham City Transport is giving new meaning to local legend Robin Hood’s ‘Nottingham Green’. The city has taken delivery of biogas (renewable natural gas) -powered double deck buses. A total of 53 Scania double-deck buses will be introduced into service during 2017/18, claimed to be the largest such fleet in the world. 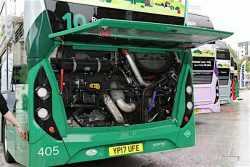 By 2020, Nottingham City Transport, the local authority-owned bus company, intends to operate more than 120 biogas-fuelled buses out of its heavy fleet of 300 buses. Nottingham is a vibrant centre of commerce. But with success comes challenges, and in common with other leading towns and cities Nottingham has its fair share of congestion and pollution. Nottingham City Transport fulfils a total of 50 million passenger journeys a year on its extensive network of routes around the city and surrounding boroughs. The city proudly states these brand new renewable natural gas buses are the greenest buses on the road and will make a significant reduction to its carbon footprint and improvement to the air quality in Nottingham. 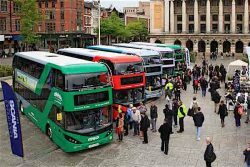 By fuelling the buses with biogas, Nottingham is helping reduce the amount of food, farm and sewage waste going to landfill or not being reused, which produces high volumes of methane when left to decompose naturally. As methane is one of the most potent greenhouse gases, the biogas buses will reduce the amount of greenhouse gases released into the atmosphere. Nottingham City Transport has worked closely with local company Road Gas to design and build a Gas Station at the Parliament Street Garage. Road Gas produces the biogas through anaerobic digestion and injects it into the national gas grid at the nearest point to production. An equivalent volume of gas is draw out from the nearest national gas grid point to Parliament Street Garage, where it is compressed and stored until the bus is fuelled up each night. The process eliminates the requirements for fuel deliveries to the depot by truck, which also reduces vehicle emissions as part of the supply process. The biomethane consumption is tracked closely by the Green Gas Certification Scheme, run by the Renewable Energy Association. Scania provides two days of technical training for all biogas bus customers. The first day focuses on product training with Scania buses, plus an introduction on biogas solutions for your technicians. The second day is organised by Swagelok and includes technical maintenance training for the high pressure system, plus safety certification for technicians responsible for managing a biogas operation. Swagelok, an NGV Global corporate sponsor, helps customers with their critical fluid containment systems needs for system critical operations such as fuel systems on natural gas vehicles, or their filling stations.